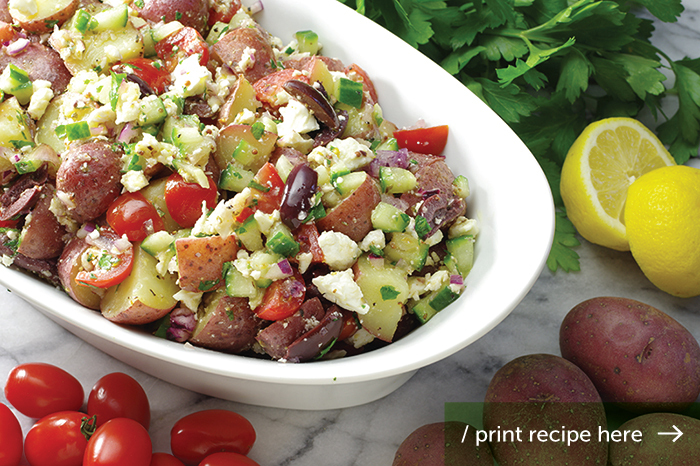 We’ve taken one of our favorite salads, Greek salad, and applied the flavors to potato salad! 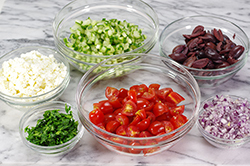 The key ingredients include lemon, feta cheese, Kalamata olives, and oregano along with other vegetables such as tomatoes, cucumbers, and red onion. 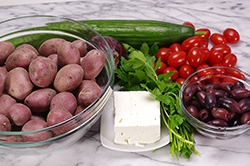 The potatoes dominate the salad but readily absorb the piquant, enticing flavors so characteristic of Greek salads. The bright colors create a lovely table presentation. Serve this salad alongside grilled chicken breasts, or pan-seared salmon. It’s a great salad to enjoy on the patio, at a picnic, or floating on the pontoon. 1. Scrub the potatoes well, cut into a 3/4-inch dice. 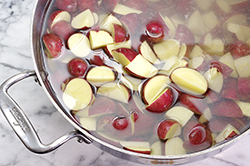 Submerge the potatoes in a saucepan with cold water. Salt the water generously as you would for pasta. Over medium-high heat, bring the potatoes to a boil, then reduce heat to a simmer. Cook until the potatoes are just tender to the tip of a knife. Do not overcook. 2. Meanwhile, prepare the dressing so that it is ready once the potatoes are cooked. 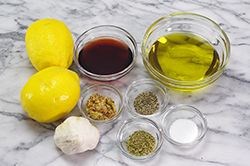 Combine the vinegar, lemon juice, olive oil, and mustard together. Add the garlic, oregano, salt and pepper. 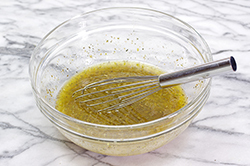 Whisk until the dressing is combined well and emulsified. Set aside. 3. 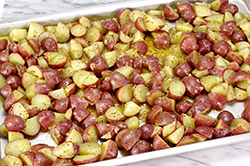 While the cooked potatoes are still warm, toss with the dressing. Allow the potatoes to continue cooling until completely cooled. 4. 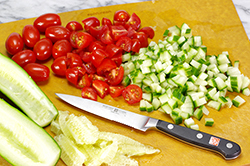 Prepare the remaining vegetables by slicing the tomatoes, dicing the onion and cucumber, mincing the olives and parsley, and finally, crumbling the feta cheese. Combine all together in one bowl. Toss with the fully cooled, dressed potatoes, Serve and enjoy!